Nobody does Painting Events like we do! Join us at AmherstWorks as we celebrate and participate in ARTWEEK with the Amherst Center Cultural District! We have some private parties already scheduled. Contact us to plan your own party! Have you tried this yet? Join us on Wednesday, May 1st, 6:30pm-9:00pm, at AmherstWorks and see why we have so many fans! #artcontinues, led by 37-year veteran art teacher Teri Magner, promotes art learning for all ages in the Amherst area. 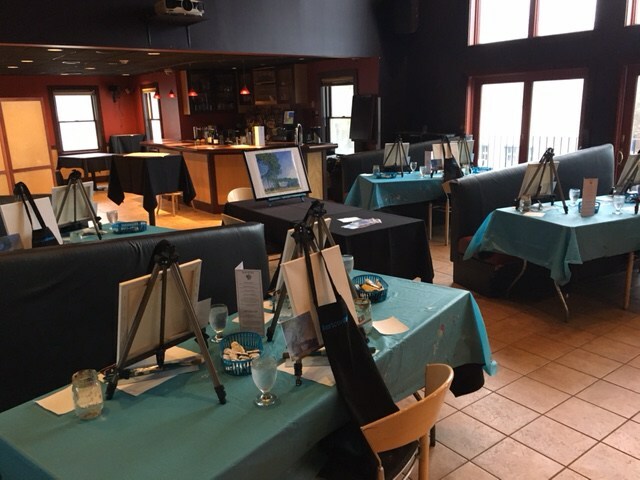 We currently offer Wine & Painting Events for all skill levels and Private Parties & Fundraisers as well as Corporate Team Building Events in the Pioneer Valley. Ask us about our college and university offerings, and other painting events, too! Plan ahead! Pick a date for your Private Painting Event or Fundraiser or staff party!! Teri, along with Sue Crutch, currently host monthly public events at AmherstWorks, as well as private parties and fundraisers there, and at many other locations in the Amherst area and the Pioneer Valley. We are so excited that "art continues"! Contact us to schedule a private party for friends, family and/or colleagues! We have many exciting spaces available for events, depending on size and occasion! Enjoy a 5% discount at Russell’s Liquors when purchasing your beverage for one of our BYOB events! Join us sometime! Have you tried this yet? Bring some friends or come and meet people! 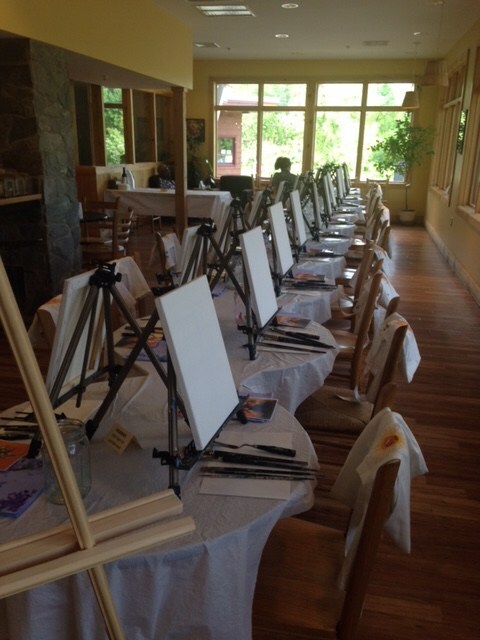 From 6:30 p.m. - 9:00 p.m., our events offer everyone, of every ability, the chance to paint a masterpiece! No prior painting experience is required. $30.00 includes all instruction, materials & supplies. Paint a stretched canvas (included) or upgrade to a canvas tote bag with a printed picture frame ($12), or a bib apron with a printed picture frame ($14). Discover your artistic ability and learn about the artist of the night and their particular style, as you enjoy the camaraderie from the many you will meet! We missed the whole group picture — but, “WOW” — these! ”Did you miss this?” Sign up now for march! wednesday, May 1st from 6:30-9:00PM at AmherstWorks. featuring Georgia O’Keeffe’s Petunias — partnering with Amherst Center Cultural District for Massachusetts ArtWeek. And a great crowd at the Powerhouse at Amherst College! Event Pics!-- We love these great memories! On Thursday, Dec. 6th, 2018 The Powerhouse at Amherst College was filled with Georgia O'Keeffe's Poppies — 50 participants! Manet’s Lilacs were the focus of our fabulous December 5th, 2018 painting event at AmherstWorks! Wed., July 18th, 2018 at AmherstWorks was another "painting choice" event -- cool summer palettes in both O'Keeffe's From the Lake, No. 1 and Cezanne's Blue Landscape. No favorite here, both choices proved to be amazing! Wed., June 20th, 2018 was an exciting evening -- with lots of choices for color in the blossoming trees of Monet's Le Printemps! 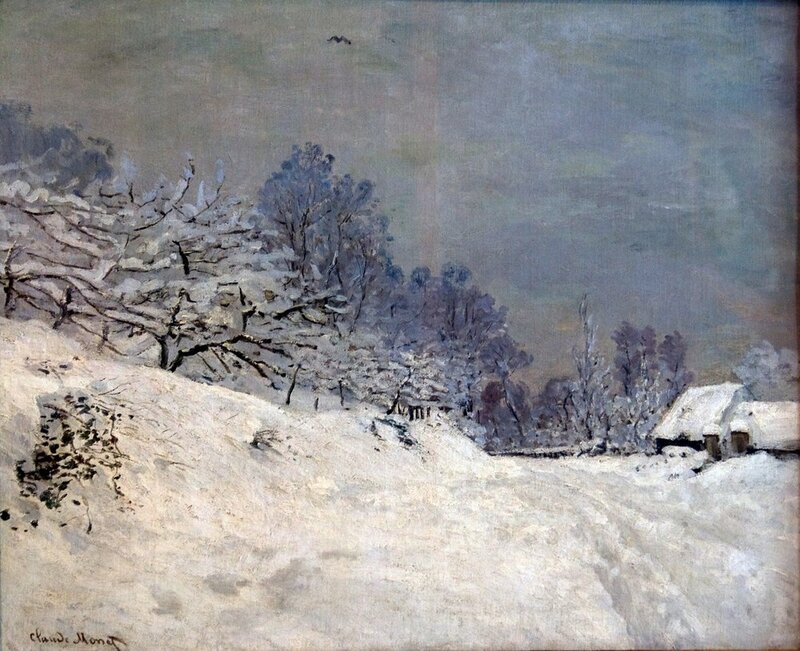 Wed., Feb., 6th, 2019 was our perfect pairing event with Amherst’s WinterFest featuring a Monet snow scene that was one of his favorites! Wed., March 21st, 2018 was our very first Manet -- Moss Roses in a Vase --a perfect entry to spring! Wow! Exceptional canvas paintings and tote bags and aprons! Private parties are easily arranged. With a minimum of 10 participants and a maximum of 100, you can celebrate any event (birthday, anniversary, etc.,) or provide an opportunity to share this social and enjoyable new art experience with your book group, office staff, or other colleagues, professionals and friends. We have hosted all of the above, as well as “going away parties”, “memorial/remembrance events” and FUNDRAISERS! Everyone takes away their own exceptional painting! “I just wanted to thank you for such a wonderful night ! I loved the information about Van Gogh, the relaxed and fun atmosphere, your patience, and the time you took to help those of us that needed it. I have never had the opportunity to take any art classes so I felt a little apprehensive about not knowing what to do but you made it such a fantastic experience! 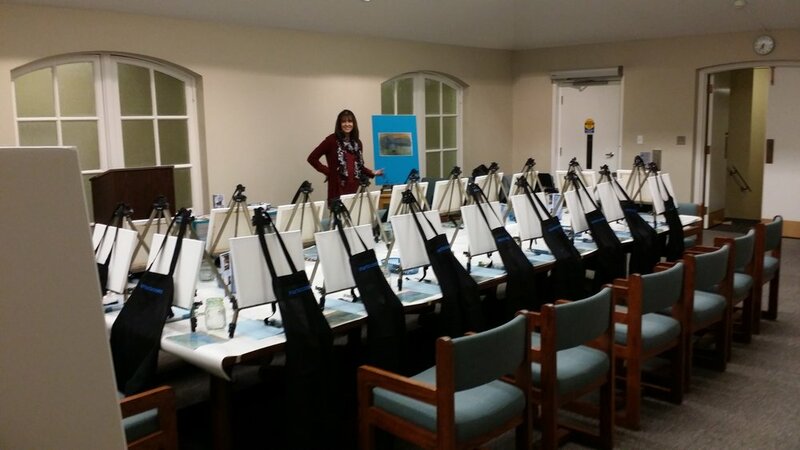 #artcontinues Painting Parties can be hosted at a variety of locations. We travel to private homes, offices, & businesses for some “on the spot” team building! There are also spaces available for rent-for-your-event at AmherstWorks, Bistro 63 At The Monkey Bar, and other local venues! You choose the date, and the painting from #artcontinues’ extensive collection. We provide all instruction, equipment and supplies. 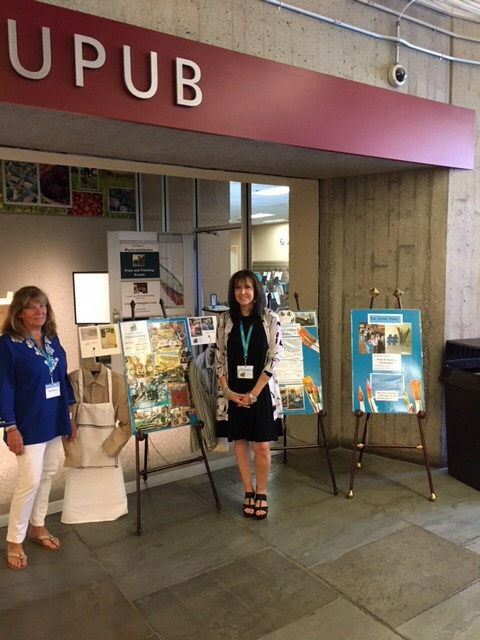 #artcontinues Wine & Painting events at the MTA Conferences at UMass, Amherst in August 2016, August 2017 and August 7th, 2018 were great successes! We've had three consecutive years of painting with fantastic teachers from all over the state! The Casey's Cruisers' ALS Fundraiser at Atkins Farms Country Market was an awesome success! With great refreshments and great paintings — it was a win-win for all! The painting for this May 23, 2018 fundraiser was Monet's Path to Pourville. On April 3rd, 2018, we hosted a private party (combined with sign-ups from others interested) at Bistro 63/Monkey Bar. Great food -- great drinks & great painters! We like it that way! EAT. DRINK. PAINT. On January 18th, 2018 we broke our record at any one event (86), at UMASS with RA's as they began a new semester! 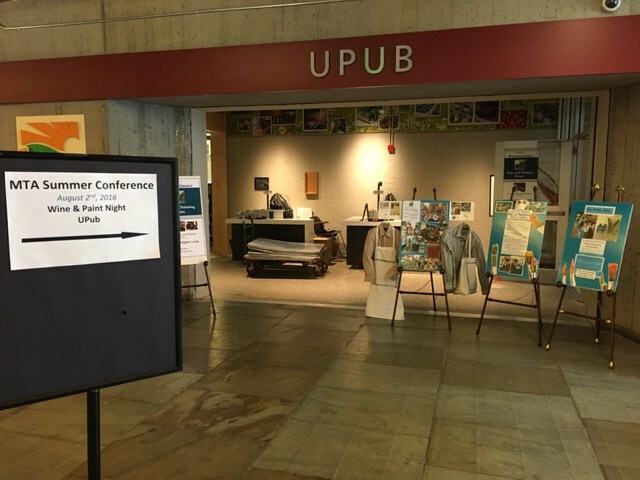 On August 28th, 2018 we hosted another successful UMASS event -- for RA's! We almost broke our newest record of 96, with close to 100 painters! We have loved hosting multiple #artcontinues events at Porter Lounge at Amherst College, with it's outstanding light! And on Friday, August 31st, 2018, we added another awesome Amherst College space to our repertoire -- the Powerhouse! Looking for a collaborative event? #artcontinues' team building events are easily arranged and individually designed to bring groups together to work creatively toward a goal. We work with corporations, schools, offices, and businesses, small and large, to provide a rewarding and memorable experience! We provide all painting instruction, equipment, materials and supplies! Let us plan your next corporate/group event! Join us! Have you tried this yet? Details to follow with dates and sign up information! Bring some friends or come and meet people! All instruction, materials & supplies are provided. Paint a stretched canvas (included) or upgrade to a canvas tote bag with a printed picture frame (additional $12), or a bib apron with a printed picture frame (additional $14). Come discover your artistic ability and learn about the artist of the night and their particular style, as you enjoy the camaraderie from the many you will meet! I am currently offering individual and small group adult painting and drawing lessons. Email me with requests and any questions — tmagner.art@gmail.com. Send me a message to get more information or book your date. I'll get back to you ASAP. #artcontinues provides wine and painting classes, art lessons, and private painting events & fundraisers in Amherst, Northampton, Springfield, Hadley, and all over the Pioneer Valley and Western Massachusetts.